Use the Loop Exit Block to stop processing within a Loop, and continue to the next Block in the Map after the loop. Loop Exit Blocks can be used with any Block that loops; that is a Loop, Fetch, or a For Each Child Block. TIBCO Scribe® Online skips any Blocks after the Loop Exit. Therefore, while not required, the Loop Exit should be the last Block in its stack. 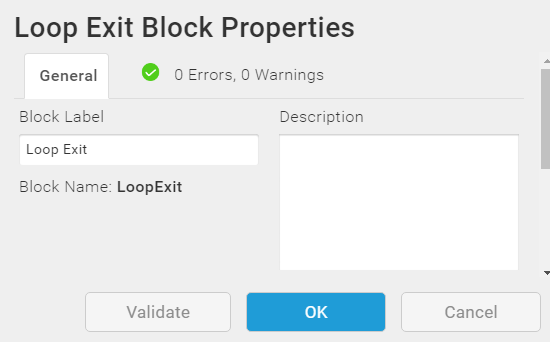 TIBCO Scribe® Online displays a warning if a Block follows the Loop Exit Block within the Loop. Tip: Use Loop Exit to exit a Fetch, For Each Child, or Loop Block. From the General tab, you can change the Block Label and add a description. If there are any errors or warnings for this Block, the Errors and Warnings tab displays the number of errors or warnings in the tab name. See Block And Map Errors And Warnings. Once you have corrected the errors, select the Validate button to update the Errors and Warnings tab.